From left, Mike Samson, FMLD board member, Gregg Rippy, FMLD board president, Todd Leahy, city council member and mayor pro-tem, Rob Stein, RFSD superintendent, and Audrey Hazelton, GSES principal, do the honors at a Wednesday ribbon-cutting for the new School Street improvements. 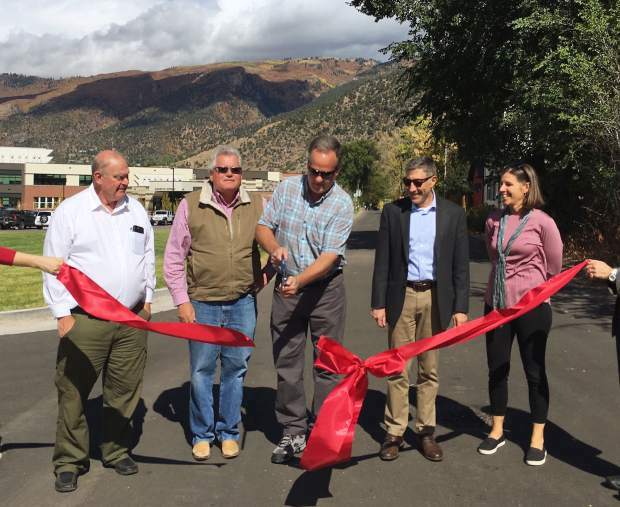 The city of Glenwood Springs recently completed a major street upgrade that ties in with future development of the confluence area through a land swap with the Roaring Fork School District. The land swap included the previous recycling center, part of Vogelaar Park, and the current YouthZone leased property. Last spring, the city and school district received a $175,000 Garfield Federal Mineral Lease District grant to repave and make other improvements to School Street near Glenwood Springs Elementary School. The city and the school district each committed a $50,000 match to receive the $175,000 in grant funding. Upgrades included pedestrian safety and traffic flow improvements adjacent to the newly renovated GSES building. The street was regraded and repaved with drainage improvements and traffic calming elements on School Street between 10th and 11th streets. A new sidewalk was also added on the south side of 11th Street.